Francis Fitzpatrick was the son of Hugh and Alice Fitzpatrick, of Donaghmore Road, Dungannon, County Tyrone. He was born about 1893. The 1901 census records Francis as age 8, living with the family at Savings Bank, Dungannon. By 1911 the family had moved to Anne Street, Dungannon. Francis was now 19 and working as a machine hand in a mill. His father was now a labourer. Private Francis Fitzpatrick was with the 2nd Battalion of the Royal Dublin Fusiliers when he was killed on 9th May 1915, age 22. 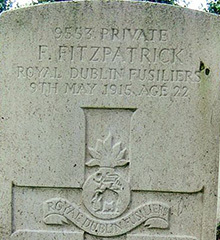 Francis had a brother, Bernard Fitzpatrick, who was also killed in World War One.